“A place for everything, everything in its place”. We don’t know who authored this, but we’re betting it was a parent (and likely a mom!). After remodeling my kitchen and getting a mammoth-sized fridge, I was left with a tiny pantry. I tossed everything into that tiny space without a second thought. Soon I discovered the HOT MESS it had become and how the disorganization rendered me incapable of getting meals made and tasks completed. I needed an organization intervention! Buy clear containers for flour, cereals, grains, pasta, cookies, crackers, sugar, etc. 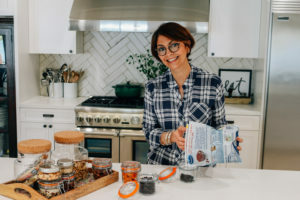 The clear containers offer an instant visual of amounts on hand so you have an easy read on when it’s time to stock up. Invest in a Lazy Susan for spices, oils, salts.It makes the most of a tiny space. Purchase different sized baskets if additional storage is needed for overflow. Take out all pantry belongings (EVERYTHING) and place them on the kitchen counter. Take inventory. Discard products that are reasonably past expiration dates and those products that haven’t been used in 6+ months. Transfer dry goods into storage containers as soon as you get home from the grocery store. This will keep your food fresh longer and your pantry looking neat and tidy. Keep a jar in the pantry with chip clips. You’ll know exactly where to find one when you need it. Think beyond the pantry, especially if your pantry is small. 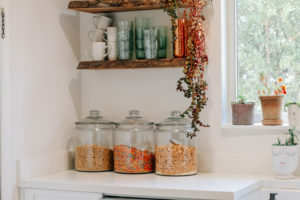 Keep some pantry items on your kitchen counter, like cereals in big glass jars; dried fruit, nuts, and some small snacks on a tray; spices can be beautifully arranged on open wall shelves. 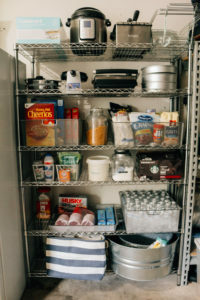 Remember: Your pantry is not the kitchen’s junk closet. When you keep it organized, you keep it functional. 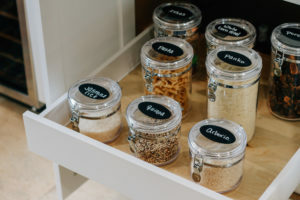 For more tips and tricks on maintaining a happy, healthy, and organized home, visit us at The Mad Table website. And be sure to like The Mad Table on Facebook and follow us on Instagram for all the latest news, fabulous recipes and gorgeous entertaining tips and ideas.